The virion fibers attach to the host cell surface lipopolysaccharides (LPS) thereby initiating infection. 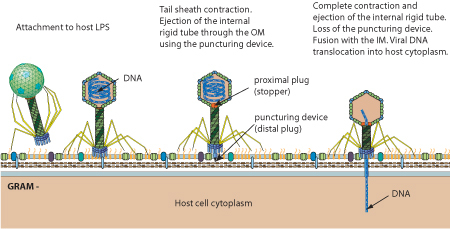 Upon binding to the host cell surface, the baseplate changes its conformation and triggers sheath contraction, driving the rigid internal tail tube through the cell envelope leading to viral genome entry. The genome of Mu phage dsDNA is linear, about 40Kb in length and encodes about 56 genes. 50-150 bp and about 2 Kb of bacterial DNA are respectively covalently linked at the left and the right end of Mu genome. The presence of these pieces of bacterial DNA is due to the headful packaging mechanism. The N protein, which is present in the virion, is ejected with, and binds to the viral DNA in order to circularize it. The DNA ends are thus protected from host nucleases. There must be some early transcription giving rise to at least the Repc and Ner repressors and to the DDE recombinase A (MuA) which performs the integration. Flanking bacterial sequences are cut away from the viral genome prior to integration. The ratio of Repc and Ner repressors determines if the phage enters latency or lytic cycle (replication). Repc represses the early promoter thereby establishing latency. Ner represses Repc expression thereby promoting early genes expression leading to the onset of viral replication. When the repressor Repc is inactivated, both the DDE recombinase A (MuA) and the target DNA activator B (MuB) are expressed. 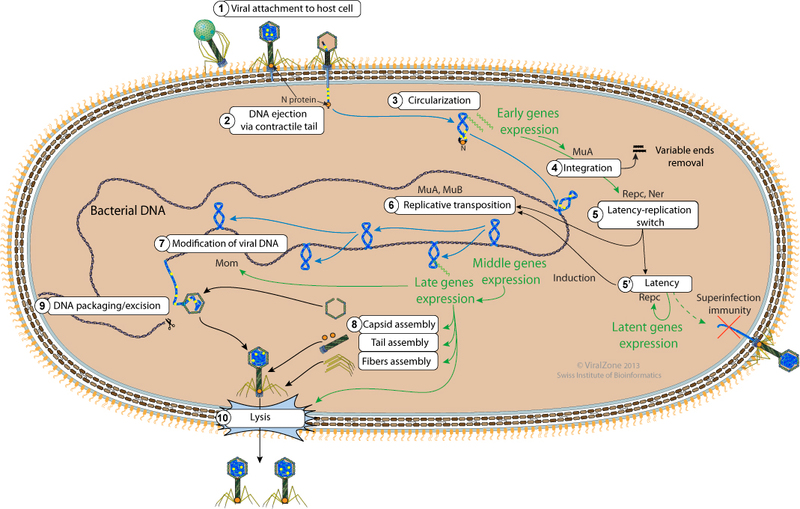 MuA is part of the transpososome complex which performs recombination between the viral genome ends and the host DNA. This viral-host DNA structure is resolved by target-primed replication leading to two copies of the viral genome. This process is called replicative transposition. 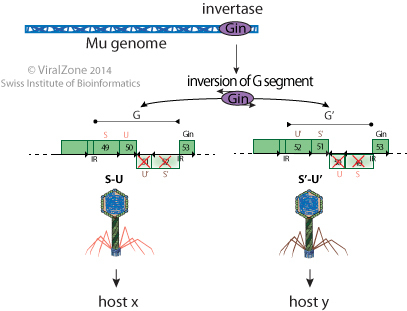 The selection of the transposition sites is performed by the MuB. Successive rounds of replicative transposition can lead up to about 100 copies of the viral genome. 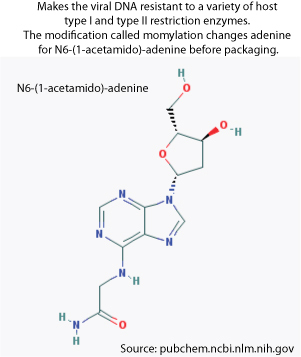 Late transcription allows the expression of the adenine modification enzyme which modifies the adenines in the viral DNA in order to make it resistant to the host restriction enzymes. The new viral particles that will be formed will thus be protected. Structural genes are also expressed in the late phase leading to the assembly of empty capsids, fibers and tails. The bacterial DNA is cut 50-150 bp on the left of the integrated Mu genome to initiate packaging and a second cut occurs once the phage head has been filled. 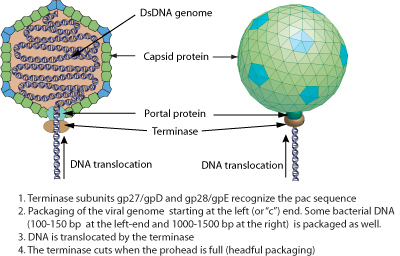 Since there is a bit more space in the procapsid than required for the viral genome, some bacterial DNA on the right side of the Mu genome is also taken and packaged with the viral genome. Since each Mu genome is packaged from a different site in the bacterial genome, the host DNA on Mu ends is unique in every different phage head. The newly synthesized virions are released by lysis. Upon binding to the host cell surface, the baseplate changes its conformation. This change in conformation triggers sheath contraction, driving the rigid internal tail tube through the cell envelope and leading to viral genome entry. The N protein, which is present in the virion, is ejected with, and binds to the viral DNA, leading to non covalent circularization. The DNA ends are protected from host nucleases. Early transcription gives rise to Repc and Ner repressors and to the DDE-recombinase A (MuA) and the transposition activator MuB. MuA and B catalyze the first integration by conservative transposition. 3'-flanking bacterial sequences are removed as a result of the transposition reaction. Integration is required before any latency versus replication decision is taken. Mu replicative transposition leads to 50-100 new copies of the viral genome in the host chromosome and often causes deletions and inversions in the latter. Unlike cut-and-paste transposition, Mu DNA is not initially excised. The portal protein and the viral protease I form the initiator complex. The scaffolding protein Z and the capsid protein T are added to the initiator complex to yield the immature procapsid. The viral protease cleaves the portal protein making the procapsids competent for DNA packaging. Mu can change its fibers specificity through a site specific inversion of a genome segment catalyzed by a virally encoded invertase. This genome segment codes for two alternate sets of tail fibers thereby expanding the host range of the phage. The repressor Repc promotes latency by repressing the transcription from the Pe (early) promoter and therefore blocks the expression of the genes required for replication (lytic growth). Only about 0.1% of the infecting Mu phages enter into latency. The replication versus latency outcome is regulated by two repressors. Repc promotes latency by repressing the transcription from the Pe (early) promoter and Ner promotes viral transposition and lytic development by blocking the major repressor Repc expression. Tail tube proteins polymerize on the tape-measure protein and the tail terminator gp37 stops the assembly once it has reached the correct length. A similar process allows polymerization of the sheath protein around the tail tube. Expression of lysis genes releases the neosynthesized phages.